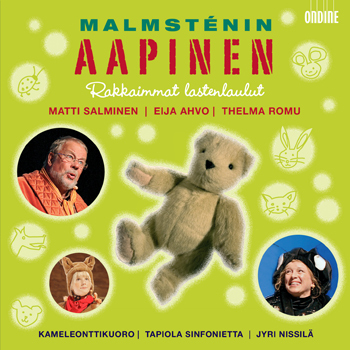 This CD contains the sound recording of the acclaimed stage production Malmsténin Aapinen ("Malmstén's Alphabet"). A Finnish star cast including bass singer Matti Salminen and actresses Eija Ahvo and Thelma Romu guide the listener through the nostalgic world of Georg Malmstén's children songs. Jyri Nissilä conducts the Tapiola Sinfonietta and the Kameleontti Children's Choir. Georg Malmstén (1902-1981) was probably the most popular Finnish entertainer of the 20th century. He originally aspired to become an opera singer and actually performed with Aino Ackté at the Savonlinna Opera Festival in 1930. After his records had become best-sellers, he moved towards a career in popular music. He eventually made over 800 recordings, ranging from children's songs to foxtrots and tangos. His children's songs have been hugely popular in Finland. The 2008 stage production of Malmsténin Aapinen is a co-production of the Finnish National Opera and Tapiola Sinfonietta, written and directed by Eija Ahvo.